A water company is considering emergency measures after the long dry spell in Cumbria. United Utilities is planning to apply for permission to take extra supplies from Windermere and Ullswater unless there is rain in the next few weeks. The last time that was done was in the mid 1990s. She said: "We do our own rainfall monitoring and our own figures have shown it has not been this dry since about 1959. So it has been an unusual year." She said the reservoirs will recover quickly if there is a decent spell of rain. 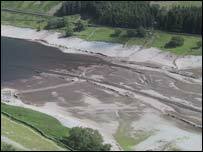 But Ian Brody, from Friends of the Lake District, said the company should have told people to take measures sooner. He said: "I think if the public had been told we were going to go for a non-essential use ban, then I think we would have got the message across about the need to conserve water far earlier and not necessarily be at this stage now." The dry weather has meant the village of Mardale which disappeared when the Haweswater valley was flooded in 1935 has reappeared. It was done to create a reservoir to provide for the water needs of Manchester. When water levels are very low, the walls of Mardale can still be seen. It is usually only visible in long, dry summers but has reappeared because of the recent lack of rain.